I initially developed the Inner Beauty Project with my friend and collaborator, Elana Langer. We were aware of some of the recent stunts big advertisers had been pulling - selling soap & maxipads through campaigns that claimed to assuage women's supposedly raging insecurities: Listen, little ladies: you're beautiful even though you worry your silly heads thinking you're horrible. (Don't look at us! We have nothing to do with your neuroses!) By the way: if you use this goo, made by us, the super-compassionate-still-testing-on-animals-multinational-corporation, you'll be even more beautiful. We knew there was something icky about this manipulative rush to cash in on Inner Beauty as a new marketing angle, but we were still drawn to the potential of makeup compacts, with their sleek boxes, shiny mirrors, and sparkling powders. They are portable shrines. They are sacred space and transformation, right there on the bathroom shelf. Elana and I worked together to develop the Inner Beauty Products and to stage the first iterations of the Inner Beauty Bar. Soon, it became clear that our next steps would be to each find her own way to manifest the project in the world. So, here I am! From that "ah-ha" moment I realized I had a choice to nourish my inner self/heart instead of/as well as applying cosmetics to my surface. Then the purpose of the shrine becomes clear. It contains a meditation that is the nucleus of how to begin to do that. Finally there was the realization - which the mandala helps - that my time might be at least as fruitfully spent on the internal nurturing as the outside. There is only so much you can do with how you look, even today. We have structural limitations, we age, we die. These are the boundaries of life. There are limits. Within these limits come the choices of what you make of what you have. How you direct your attention becomes important. Since outer is so much the default in our society, how about inner? These concepts have been helpful to me. The compact/shrine itself is beautiful. At first it was a reminder of these concepts - that I have inner beauty in my heart which it can be enhanced by the nourishment by my attention. Then, by use, it has become increasingly precious as that feeling of inner beauty has begun to flower in my heart. …is basically what happens when people gather to consider what Inner Beauty might actually be, and how to manifest it on this wild & wooly planet. The world-premiere was in White River Junction, VT, in November 2013. 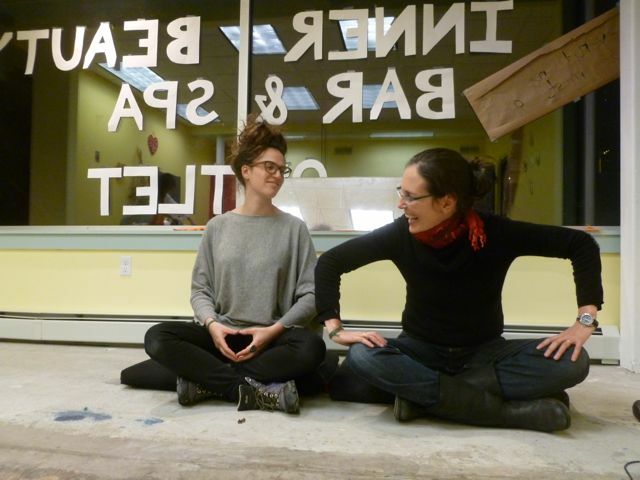 Elana Langer and I took over an empty shopfront, and invited the local community to join us for Black Friday (aka Grand Opening), and the day after (aka Closing! Everything Must Go). We didn't yet have any of our products manufactured, and so we had to rely on the Inner Beauty Treatments, and the sense of creating an open, creative space for people to meet in and co-create an experience of acceptance and community. After that, came other opportunities for the Inner Beauty Bar. Elana & I traveled to Northampton, MA & wound up staging an impromptu Inner Beauty event in a tiny strip of green on one side of the main drag. Again, there was a sense of creating a soul-refuge & a safe place for being. People stopped to talk, spend some time with us, and consider the pleasures & terrors of their lives. What makes you free? The fact that I have been to jail already & so I don't have to fear it anymore. The fact that I have a mental illness. What makes you not-free? The fact that I have been to jail. The fact that I have a mental illness. Since then, the Inner Beauty Bar has been many places, including the Toronto International Film Festival, some Unitarian Universalist church services, several town greens, some crafts festivals & Wellness Fairs, and several beautiful house parties. In the Fall of 2015, I embarked on The Inner Beauty Pilgrimage to the Sacred-Ordinary Everywhere, a crowd funded adventure that took me 3000 miles around the East Coast, and then onwards for a week in California. I visited schools, colleges, galleries, churches & meditation groups, and it was amazing.